There are reports in certain sections of the media suggest that Hassan Oktay, a coach of Cypriot Turkish origin, will be taking over as head coach at Gor Mahia FC. Oktay has spent most of his coaching career in the UK and has mostly coached none-league teams. He is currently assistant coach at Braintree Town FC where the head coach is another Turk Hakan Hayrettin. Braintree is a semi-professional team that plays in the English fifth tier. They are currently at the bottom of the table and are certain to be relegated further. Oktay and Hayrettin have coached together at three separate teams with Oktay being described as the tactical mind and Hayrettin as the motivator. According to Mike Okinyi, Oktay will be on 3 months probation. He will watch the match against Kariobangi Sharks from the terraces. 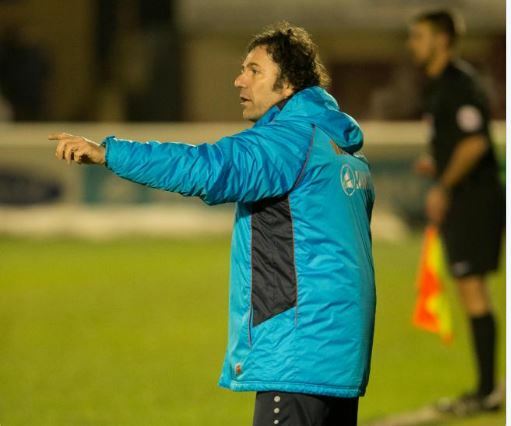 Oktay gained his UEFA A Licence at West Ham United and has also worked at Grays Athletic where he was head coach in 2013, Banbury United where he was assistant coach as well as Watford Academy, Waltham Forest and Thurrock. In his last head coaching gig, he coached Grays athletic in the Isthmian League which is a regional league in London. The club finished 14th out of 22 teams. And at Thurrock he did not exactly get a ringing endorsement. Can anyone recomend a good Assistant Manager who will join Non-League Thurrock in Football Manager? I had to sack Hassan Oktay. He was crap. Can U give us reasons as to why you finally settled on this man out of 53 applicants? You old people born during (or years right after ) independence were completely brainwashed by the colonial masters to believe that only the mzungu can provide you with something good. Please just do us a favour by retiring and move to ushago. We the younger generation and future of Kenya believe in ourselves and our own people. You see, soccer is not a difficult game at all; does anyone really believe that after 55 years of independence, we cannot produce our own coach and have to outsource it to a foreigner? As I stated previously, there is nothing that Kerr did that a local coach could not do! We have massive joblessness here in Kenya and yet we hire a mzungu for a job that can be ably filled by a Kenyan. So, like I said before, if the plan to bring a mzungu coach comes to fruition, then Gor tutapeleka nyasi. Lazima! Ati Gor mtapeleka wapi? You and who? Ijoit. Yes, football is watched and loved by all people and of all ages and races as it ahould. My point here was that older KENYANS (including Rachier) seem to think that only good things come from a mzungu. Does anyone with brains really think that this Hassan guy has better credentials than Zico? Please don’t forget that Mohamed Kheri is the only coach to have taken Harambe stars to AFCON multiple times…and he was from where? @Gor Mahia Player, let us not be racist, year in year out, in the FIFA rankings, European and South American countries rank high. Which African country has ever reached World Cup semi finals, leave alone winning the cup. Let us not be racists and accept reality. Stop posting yourself as Gor player on this platform ur argument can be compared to that of a bird in fact Gor players have big Brain to good fans is the match going to be live on any TV channel? Who this gor player?does he watch english lig?let me count for him,and he tells me which england club is being coached by an england and it’s performing.1 man city 2.liverpool 3.Chelsea 4.tot 5.Arsenal 6.MAn United 7.westham 8 Everton 9 …so when it comes to performances we shall hire even aliens.so don’t thing’o has na people from kenya.even so kerr was here,He took the log n.a. 5 games remaining telling u what about kenyan coaches.alafu rumour has mwafrika ochaya mwafrika mwenzake.thats they perform well with whites. @Gorplayer, why throw tantrums when you & Zico can sieze this opportunity to prove yourselves? Zico has had countless chances & the next 2 games, mostly CAF match, is again another chance. Jasego & team of experts explain this Okstay choice,MUST BE CHEAP! Other than his nationality and skin color is Oktay credentials Superior to Zico ? Is he also coming on a tourist visa with no bona fide contract ?….what has Oktay achieved ……. Zico is a winner and a national team coach, Somebody pulled a number on this Hassan oktay guy! We were expecting interviews today then suddenly…..Hassan Oktay emerges a winner from a shortlist of 5 people ? Victor kidiwa, I smell a rat with my brothers and sisters in the committee but I will leave it there…. We are heading nowhere.. ….This Hassan is nothing. We lost to Sharks..May God rescue us. We are not winning 2019 league. Where are the doubters now!!!!!!!!!!!!!!!!!!!!!!!!!! !